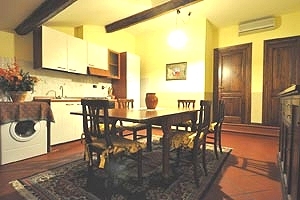 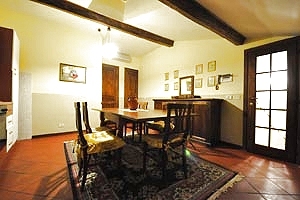 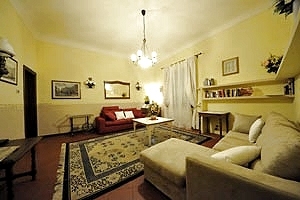 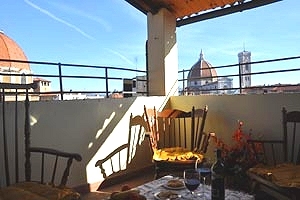 The large and well-lit apartment is on the third floor of an ancient building without elevator in Florence historic centre, in San Lorenzo district. 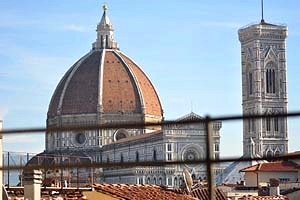 Some of the most important Florentine monuments, including the Basilica of San Lorenzo, the Medici Chapels, Piazza del Duomo with the Cathedral of Santa Maria del Fiore, Giotto's Bell Tower and the Baptistery, and the Church of Santa Maria Novella are just a few dozen metres from the apartment. 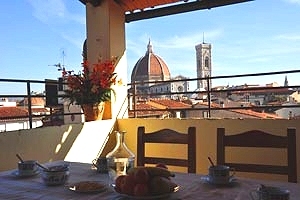 Florence Central Market, many restaurants and trattorias, and any kind of shops and services are in proximity to the building. 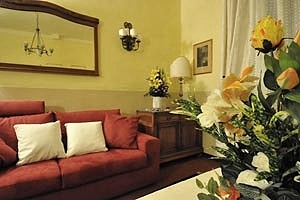 Santa Maria Novella railway station is within short walking distance. 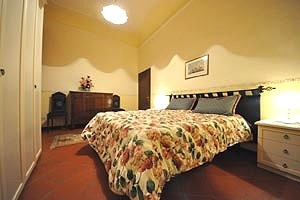 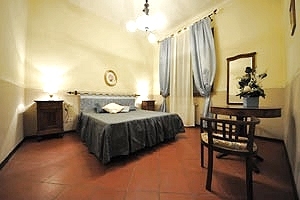 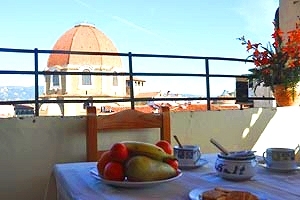 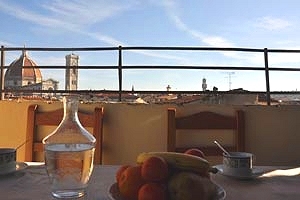 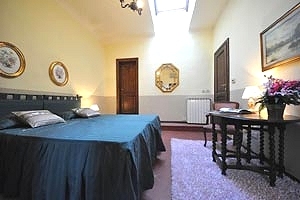 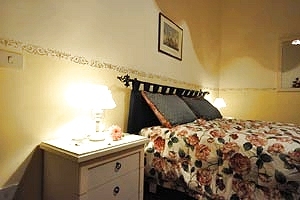 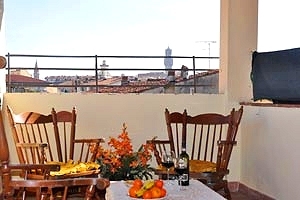 The apartment features a wide panoramic balcony that affords a wonderful view of the Duomo, the Medici Chapels, Palazzo Vecchio and the hills of Fiesole. 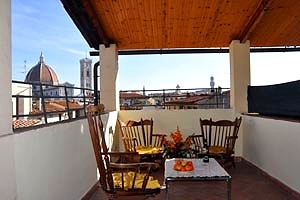 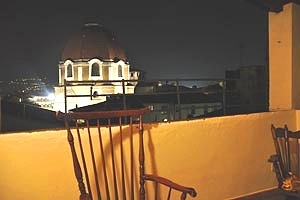 The balcony is furnished with table and chairs for having meals al fresco while admiring the beautiful panorama. 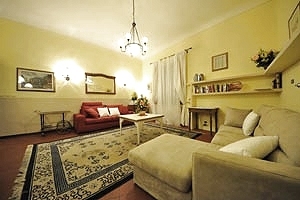 The apartment is on two levels and sleeps 6+2 guests in 3 double bedrooms and 1 double sofa bed, and has 2 bathrooms. 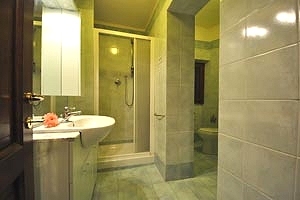 On the first level are a wide living room with a double sofa bed, two double bedrooms and a bathroom with shower. 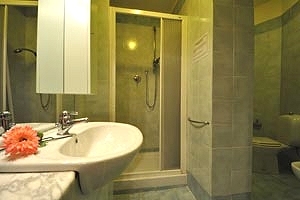 A staircase in the living room leads to the second level, which consists of the fully equipped kitchen and a double bedroom with ensuite bathroom with bathtub. 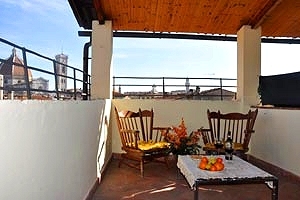 The kitchen opens onto the panoramic balcony. 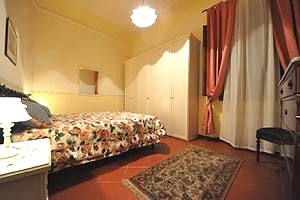 All of the bedrooms can be converted into twin bedrooms. 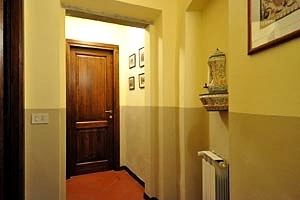 The apartment is equipped with air conditioning, independent heating system, satellite TV, Internet connection, gas cooker, oven, microwave oven, fridge with freezer compartment, toaster, American-style coffee maker, dishwasher and washing machine. 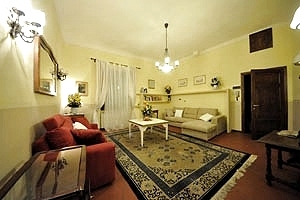 Shops and services of any kind are in proximity to the apartment. 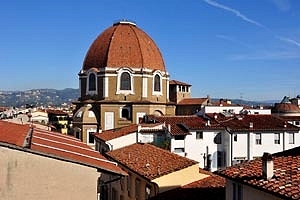 Santa Maria Novella railway station is about 600 metres from the building. 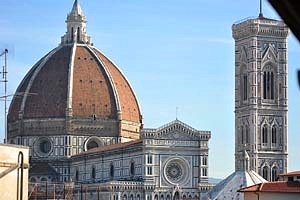 Basilica of San Lorenzo 100 m - Cathedral of Santa Maria del Fiore (Duomo) 350 m - Santa Maria Novella railway station 600 m - Piazza della Signoria 850 m - Piazza San Marco 850 m - Basilica of Santa Croce 1,5 km. 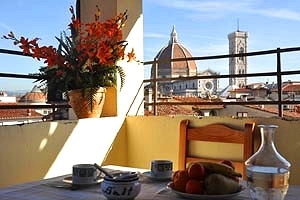 Florence airport 7.1 km.